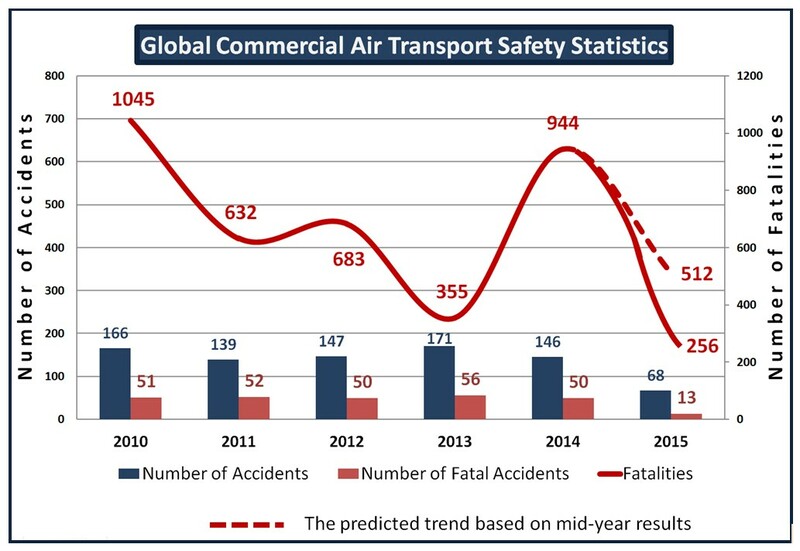 The global commercial air transport industry continues to enjoy growth and despite the concerns about the possibility of this growth resulting in increased accident numbers, the number of both fatal and non-fatal accidents is remarkably low. Unfortunately, – what I consider as – ‘Black Swan’ events such as MH370, MH17 and 4U9525 in 2014 and 2015 respectively caused high number of fatalities. The graph below indicates that a small number of high fatality accidents can adversely affect the trends. While various initiatives and the collaboration between industry stakeholders including regulatory authorities, trade and professional associations, pay dividends to achieve this remarkable safety record, the data also clearly demonstrates the challenge of identifying the pre-cursors of future accidents. An important point from airworthiness point of view is that, fortunately, none of these high profile accidents are the result of serious airworthiness issues. Of course, there are some lessons to be learned and improvements to be made related to initial airworthiness (i.e. design and production) as well as continuing airworthiness, which is IFA’s main focus. This excellent safety performance and particularly the extremely low number of airworthiness and maintenance related accidents and high profile events, creates a huge challenge for all people contributing airworthy products around the world. Because policy decisions and safety initiatives have to be based on evidence, by achieving such performance engineers become the victim of their own success. In this regard, IFA can and should continue contributing various industry committees and forums to highlight the potential risks by raising the concerns of its members. * 2015 data includes all accidents until 21 Jun 2015. Source: Data compiled from Aviation Safety Network Database (http://aviation-safety.net/database/) & analysed by Cengiz Turkoglu. Military aviation accidents and also events caused by hostile action (i.e. a number of aircraft destroyed on the ground at Tripoli in 2014) were excluded. While predicting the next accident is getting more and more difficult, one of the ways to sustain the existing low accident rate is not only to continue collaborating but also to challenge the existing norms and policies. Such an approach may not be easy and create some polarised debates between different stakeholders in the industry such as trade associations and professional bodies. As a result, the regulatory authorities find themselves in a ‘damned if they do, damned if they don’t’ situation. The controversies and dilemmas during the flight time limitations rule making activities in Europe a few years ago were the typical examples of such a situation. When such complex issues need resolution, I think the evidence based approach to rulemaking and oversight has some fundamental limitations because as the safety performance is getting better and the evidence is disappearing, we are losing the opportunity to learn from accidents and incidents. This means that we need to analyse how we achieve this excellent safety performance and disseminate the lessons and best practice across the industry. This can be achieved by various committees and forums in the industry as well as the conferences and workshops organised by organisations such as IFA, Royal Aeronautical Society, Flight Safety Foundation and many others around the world. Another way to further improve existing practices is to continually challenge each others’ views to go beyond the ‘evidence based approach’ because in order to manage risks, we need not only to consider all of the above but also discuss ‘what if’ scenarios. Now, I would like to introduce – what I call – ‘elephants in the room’ and perhaps ask some fundamental questions rather than provide answers or pragmatic solutions but I do believe that today’s issues are so complex and we need to question existing policies and industry practices more if we wish to make even further safety improvements. Before I do that, in order to set the context, let me remind you some of the targets mentioned in the two key EU documents. European Aeronautics: A Vision for 2020 – ‘Meeting society’s needs and winning global leadership’ (Report of the group of personalities) published in January 2001. Punctuality: 99% of all flights arriving and departing within 15 minutes of the published timetable, in all weather conditions. Time spent in airports: no more than 15 minutes in the airport before departure and after arrival for shorthaul flights, and 30 minutes for longhaul. Aircraft will achieve a five-fold reduction in the average accident rate of global operators. Aircraft will drastically reduce the impact of human error. Flights arrive within 1 minute of the planned arrival time regardless of weather conditions. In 2050, European aviation has achieved unprecedented levels of safety and continues to improve. Manned, unmanned, legacy and next generation, autonomous aircraft and all types of rotorcraft operate simultaneously in the same airspace and in most weather conditions. A holistic, total system approach to aviation safety is integrated across all components and stakeholders. This is supported by new safety management, safety assurance and certification techniques that account for all system developments. In addition to the above, these two documents also include many other challenging and competing/conflicting goals and targets i.e. security, environmental impact etc. I applaud those involved in the development of such reports aiming to achieve a reliable, safe, secure and sustainable future commercial air transport system but as we are only 5 years away from 2020, I also can’t stop asking myself if some of these ideas are visionary or misguided. The fundamental enabler of achieving such extremely challenging goals is of course, ‘research and innovation’. While considerable amount of funding is allocated for safety research projects, such as ASCOS (EU contribution: 3.365.884€), ACROSS (EU contribution: 19.482.059€). In comparison, I also question the level of funding provided for some other projects focused on passenger comfort (i.e. IN-LIGHT – EU contribution: 2.980.805€) while the EASA’s Budget for Research Programmes is well below such level of funding. I think this is again due to the fact that without any evidence (i.e. high accident rate), it is extremely difficult to convince the policy makers to continually invest in safety research and improvements. Although I mentioned earlier that accidents and incidents caused by airworthiness and maintenance related factors are extremely rare, the potential risks do continually exist as stated by the ICAO (i.e. in-flight engine fire/shutdown caused by fan cowls being left unlatched and aircraft being released to service). For example, “research conducted by NTSB shows since 1992 15 engine cowl events involving Airbus aircraft and 33 domestic and foreign instances of engine cowl separation on Bombardier aircraft.”; fortunately none of these events resulted in fatal accidents but unfortunately this makes it more difficult to design human error out by introducing a modification to the system, which may require considerable investment. While the cost of such modification programmes is scrutinised and becomes a barrier for introducing safety improvements, in contrast, some of the EU airlines plan $4.5 billion cabin upgrades to rival Middle East carriers as other airlines launch multi-million dollar marketing campaigns and celebrity adverts. This comparison reminds me the cliché ‘In aviation, many rules were written by blood’ but it is also another illustration of the challenge we face. Should we focus on addressing risks based on repetitive events of the past or should we aim to identify future hazards and predict the next accident by asking the ‘what if’ questions? Finally, I would like to discuss the passenger rights legislation by asking the question, ‘Can the blanket approach to implementation of EU Passenger Rights Legislation potentially compromise safety’? ‘EC261/2004 Passenger Rights Legislation’ was first introduced in 2005 to prevent airlines overbooking and not taking care of their customers. Within the last decade, the air traffic grew significantly and the safety performance of the commercial air transport industry has been remarkable; however as recently described by an airline executive, the brutal competition in the industry and the consumer protection law such as EC261 have been putting tremendous pressure on airlines to achieve on-time performance. As a result, the airlines drive operational staff such as pilots and engineers to keep the aircraft flying in order to achieve on time performance targets, in some cases by paying bonuses as well. Such external pressures are ultimately the result of travelling public’s expectation to fly faster, further, safer and cheaper without questioning how today’s complex commercial air transport system works and how it is funded. Over the last 10 years, there have been many court decisions setting precedence and putting more pressure on airlines. In 2013, ‘National Enforcement Bodies’ issued a guidance document, ‘Draft list of extraordinary circumstances’with a view to clarifying some of the controversial circumstances including delays caused by technical faults / defects; however the latest court decision towards the end of last year in the UK not to include technical faults within extraordinary circumstances was seen as a victory by the travelling public, media and the litigation lawyers, who might benefit from these decisions and policies. Subsequently, the UK CAA had no option but to announce its decision to take enforcement action against some airlines. While I am not entirely against the principles of passenger compensation which is a requirement introduced by not only EC261/2004 in Europe but also similar regulations in other countries around the world, I am very concerned about the continuing pressure we (the travelling public) are putting on pilots as well as engineers and technicians in operational environment. Since the industry is strictly regulated, some would argue that there is hardly any opportunity for people to take risks. In my opinion, there will always be circumstances where operational decision makers need to make a judgment such as whether to release an aircraft to service or not or in flight crew’s case, whether to accept an aircraft with certain defects. So let’s not influence their decisions by setting them conflicting goals. Therefore I believe the guidelines produced by the ‘National Enforcement Bodies’, were measured and proportionate approach and they should be part of the enforceable law.